Any one of half a dozen hot spots around the globe could quickly escalate to all out thermonuclear war and the possible extinction of the human race. One of them likely will, if the British Empire is allowed to continue the “divide and conquer” policies typical of all empires throughout history. In his 1983 proposal for a joint U.S.-Soviet Strategic Defense Initiative (SDI), American statesman and physical economist Lyndon LaRouche proposed a pathway for sovereign nations to escape imperial manipulation and the present thermonuclear nightmare, but that option was rejected by British-influenced Soviet leader Yuri Andropov. On 18 Oct. 2011 Russia’s then-Ambassador to NATO Dmitri Rogozin, soon thereafter to become deputy prime minister for the defense industry, proposed a new form of the SDI called the Strategic Defense of Earth (SDE): international cooperation to safeguard our planet against deadly threats from space 1. Bombardment by asteroids and comets is a part of Earth’s history that will recur. Russia’s TV channel Russia Today reported that Rogozin’s plan was intended “to focus on fighting threats coming from space rather than just missiles. … It would be an integration of antiaircraft, missile and space defenses… [The system] would be targeted against possible threats to Earth coming from space, including asteroids, comet fragments, and other alien bodies. … The system should be capable of both monitoring the space and destroying any dangerous objects as they approach our planet. … The idea has been nicknamed ‘Strategic Defense of Earth’ as an allusion to ‘the Strategic Defense Initiative’”. Upwards of one million asteroids orbit between the orbits of Mars and Venus, many of them intersecting Earth’s orbit at some point. Only a tiny fraction of them have been identified. Even if an Earth impact could be predicted with certainty, there presently exist no means to stop it. A relatively small asteroid, the size of a large whale, can devastate an area of around 800 square miles (over 2,000 km2), as happened when one exploded over Tunguska, Siberia in 1908. Every year around thirty smaller asteroids, in the range of 10 meters in diameter, explode in the Earth’s upper atmosphere with a blast equivalent to the Hiroshima atomic bomb in 1945. A Tunguska-type event is estimated to occur every few hundred years. Geological evidence shows that, over time, many larger space objects come all the way to hit the surface of the Earth. The extinction of the dinosaurs 65 million years ago was likely caused by an asteroid 10 km in diameter. Small to medium-sized asteroids that land in the ocean generate massive tsunamis, larger than the one which killed 200,000 people in Indonesia in 2004. A collision with one of the 1,000 Near-Earth Asteroids (NEAs) of more than one km diameter would devastate Earth. 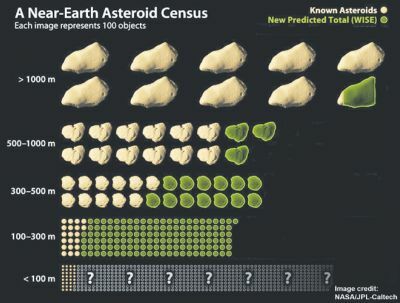 Though some 90 per cent of these large asteroids have been detected, we have no way to deflect any heading for Earth. Smaller asteroids are harder to detect, but also deadly: of the 1,500 or so asteroids 500-1,000 m in diameter, an estimated 80 per cent have been detected; of the 2,400 that are 300-500 m (still large enough to devastate a continent), only half are detected; and of the over 15,000 that are 100-300 m in diameter, just 10 per cent are detected. There are an estimated one million NEAs less than 100 m in diameter, like the one that fl attened 2,000 km2 in Siberia in 1908. Asteroid 2005 YU55 passed by Earth just inside the Moon’s orbit on 8-9 Nov. 2011, while 99942-Apophis will pass Earth in 2029 inside the orbits of many communications satellites. Those are just two of the million or more Near Earth Asteroids (NEAs), half a million of them Tunguska-class or larger. Travelling towards the inner solar system from a greater distance and at higher speeds are comets, which may be larger, more difficult to detect, and far more devastating than asteroids. Unlike non-existent man-made “climate change”, the deadly danger from space is assured, and mankind must initiate an international effort to deal with NEAs and other threats from space, such as the large solar storms of 1859 and 1921; their effects were minimal then, but today such radiation would wreck electric and communications grids for months or even years, plunging large sections of the planet into chaos.